Old USA art pottery of unknown origin- HELP! I am in the process of emptying the contents of my dear grandmother's home, who passed in October at age 100. I have been around antiques for some time as a collector of many things: Wedgwood basalt, seltzer bottles and Persian carpets, so I know enough to be dangerous! 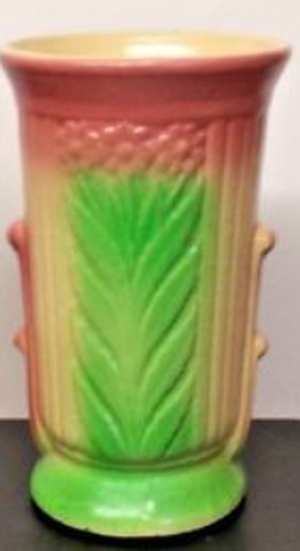 In the process of cataloging her belongings for an estate sale, after the family claimed what they wanted, I did find a few distinctive things that were fairly easily identified: a Roseville console bowl, a pair of Phoenix Glass vases...but this particular piece has me stymied. The only history that the family has on this, is that it was in my GREAT-grandmother's home. My aunt, who is 80, remembers it as a child there. As the photo shows, it's quite large, at about 19 1/2" tall. 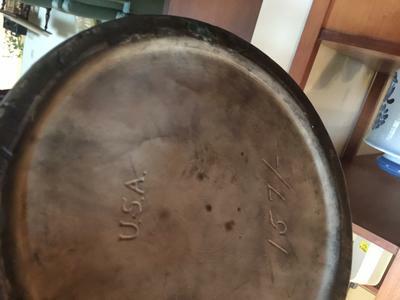 The bottom is unglazed and is marked U.S.A. 157/- . 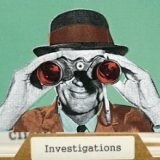 My first thought was McCoy, but I haven't found anything even close. Plus, a potential buyer told me that McCoy typically finished the bottoms of their pieces. I would love to know whatever I can about it. 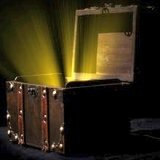 I want to get a fair price for the estate's benefit, and to have my grandmother's beloved things realize their true value, if at all possible. That said...I don't really like it! The green is rather garish and just doesn't fit it to any of our family's taste. In case anyone is wondering, I have it priced at $125 at the estate sale. The same buyer who told me it wasn't McCoy was willing to pay $100. I think this looks 1920's or 30's. It makes a kind of attempt to be Art Deco 'modern' rather than the flouncy Art Deco curly style. 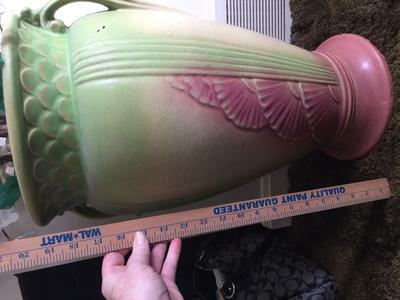 I looked at past auction lots of umbrella stands from this period and personally, I would be glad to take $100 USD for this - sounds about right. Even some famous potteries like Roseville don't go for much more than that, unless highly prized examples. 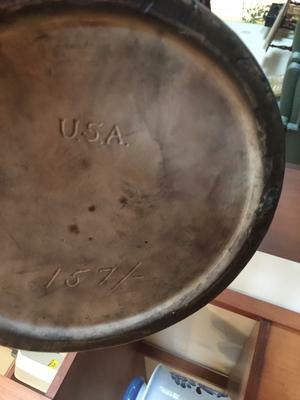 Comments for Old USA art pottery of unknown origin- HELP! That's a Robinson Ransbottom vase. Thanks for this information. Very, very much appreciated! 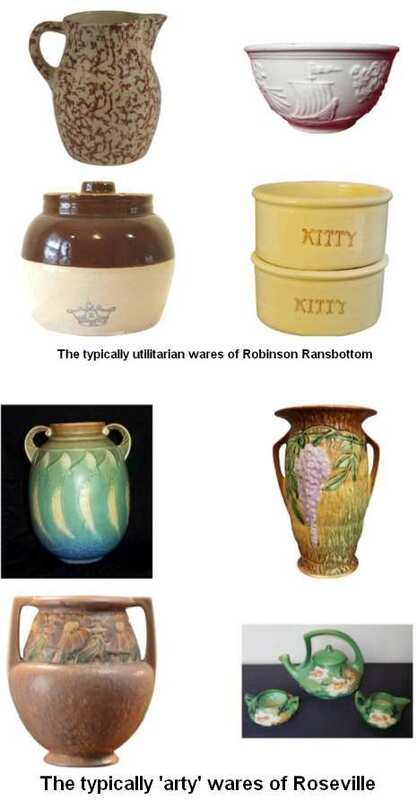 I found out the name Robinson Ransbottom Pottery (RRP) was formed c.1920 via a merger of the Ransbottom Pottery with Robinson Clay Products Co.
Based in Roseville, Ohio, USA, the company was founded originally in 1900 as Frank Ransbottom. The company managed to survive the Great Depression and lasted until the 21st century (2005). This was the same tragic decade which saw many other long established pottery and porcelain makers finally go bust (including famous name UK makers such as Wedgwood, Spode, Royal Doulton, Coalport and Royal Worcester - to name but a few). When ceramics goes out of fashion, an industry falls. So how do we tell the difference between Roseville pottery items and Robinson Ransbottom in the absence of defined markings? Well, with RRP think utilitarian stomeware in the main - with the odd flurry of art deco/nouveau as in the brightly coloured example above. 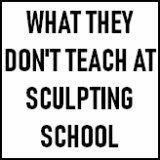 With Roseville, think more art pottery flair.